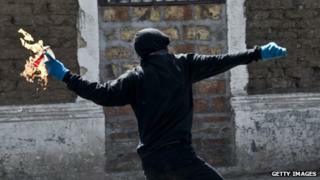 Protesters and police have clashed in Chile ahead of the anniversary of the coup led by Gen Augusto Pinochet. Police said they had arrested dozens of people for erecting barricades and throwing stones and petrol bombs. A bus was set alight in the capital, Santiago, where 8,000 officers have been deployed to prevent any violence. The 1973 coup deposed the democratically elected president, Salvador Allende, and led to 17 years of military rule. Past anniversaries have regularly been marked by demonstrations, some of which turned violent. Interior Minister Andres Chadwick said on Wednesday that "up to this moment the reports have been very positive compared to what we were expecting". He said that "major troublemakers were trying to take advantage of the occasion", but assured Santiago residents that the city was functioning normally. Protesters have erected burning barricades in two Santiago neighbourhoods, police reported. Speaking after a religious ceremony, centre-right President Sebastian Pinera called for national reconciliation. He said that the current generation of Chileans had no right to pass the hatreds of the past down to their children and grandchildren. "I'm certain that the great majority of Chilean feels that peace and reconciliation are necessary, and that after 40 years the time has come not to forget, but to overcome the traumas of the past," he said. The official ceremony marking the anniversary was already held on Monday at the presidential palace. There, President Pinera criticised the "violent coup that started a 17-year period of military rule". But he also said it was "the predictable outcome" after "repeated violations of the rule of law" under the government of socialist President Salvador Allende. A former president and candidate in the forthcoming presidential election, Michelle Bachelet, boycotted the ceremony. Tuesday saw Ms Bachelet visit Villa Grimaldi, a former detention centre in Santiago where both she and her mother were held and tortured. The site, where prisoners routinely received electric shocks and severe beatings, has been turned into a memorial park for the victims of the military regime. Holding photographs of left-wing activists who died or disappeared during the 17 years of Gen Pinochet's rule, Ms Bachelet and her mother stood in front of the stone memorial bearing the names of hundreds of victims. Ms Bachelet and her mother were detained there in 1975 before going into exile. Her father, a general loyal to President Allende, died after being tortured in detention. Speaking at the event at Villa Grimaldi, Ms Bachelet said it was important to "build a country which is capable of going forward in a more just egalitarian and peaceful way". She called for a truthful investigation into the crimes committed under military rule as "a dirty wound cannot heal". Some 40,000 people suffered human rights abuses in Chile from 1973 to 1990. More than 3,000 were killed or forcibly disappeared, their bodies buried in unmarked graves or dumped at sea. And more than 1,000 human rights cases are still ongoing in Chilean courts.